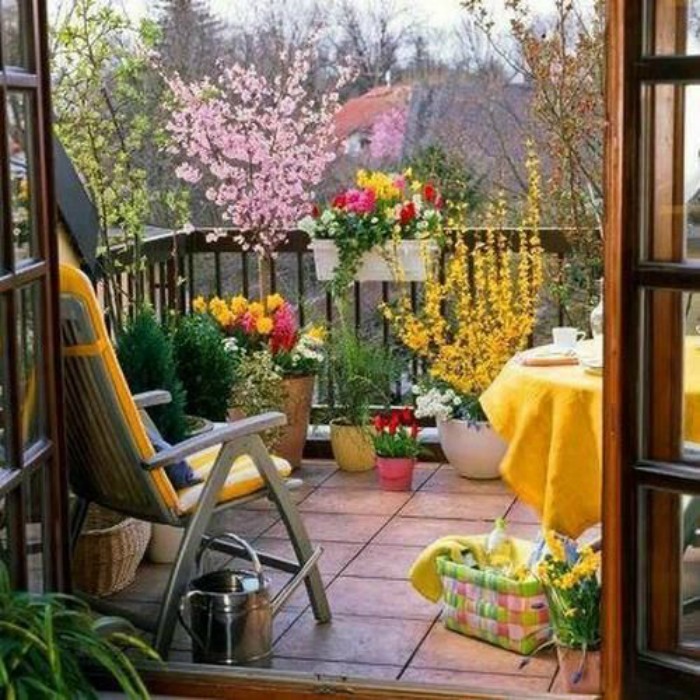 When decorating outdoor living spaces, your first instinct might be to leave the color to Mother Nature. But, we suggest doing just the opposite—create a cacophony of color with vivid accents that will compliment all the surrounding natural hues. We think investing in some teak garden furniture to fit in with the overall colorful theme you choose is a great idea. To inspire you, we’ve curated a myriad of beautiful outdoor terraces, balconies, verandas and patios that celebrate color in all its glory. Boho Hues—Want a symphony of explosive color for your outdoor living space? 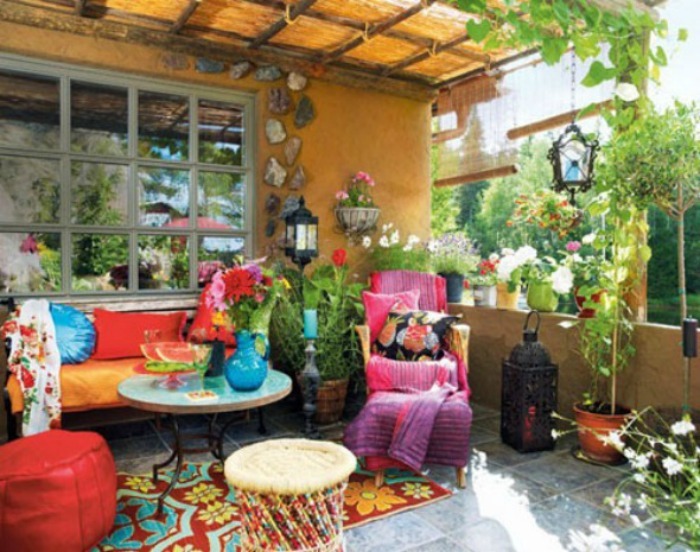 Consider going with a Boho style such as the patio above, for a colorfully eclectic look you’ll love. In addition to plentiful use of hues, this charming outdoor space melds lively patterns, materials such as wrought iron and marble, and inviting textures. Classic Contrast—A city terrace gets its bold, elegant look from a classic duo—black and white. 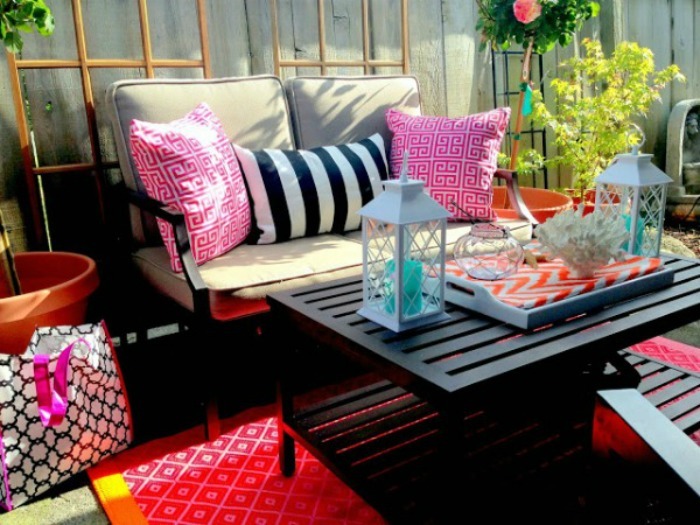 Add a few pops of pretty pink, and you’ve got an outdoor space perfect for cocktails with friends or enjoying a cup of tea and good book solo. Big Color, Tiny Space—Don’t be afraid to use vivid color, and lots of it, if you have a tiny to small balcony or terrace. 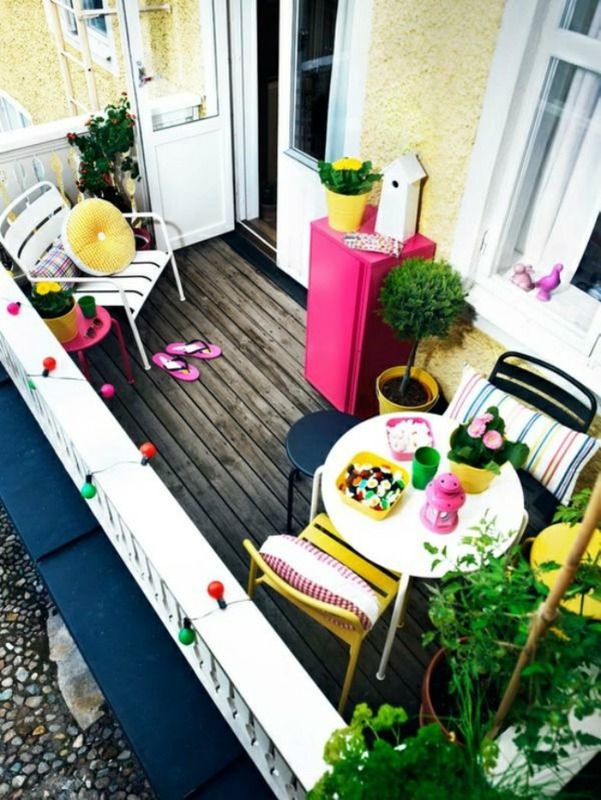 The welcoming deck above proves the point, with its happy mix of bright pink and yellow. Contemporary + Color—Even in natural settings, contemporary color combinations such as grey, black and pops of vivid color such as red, pink or orange work beautifully. 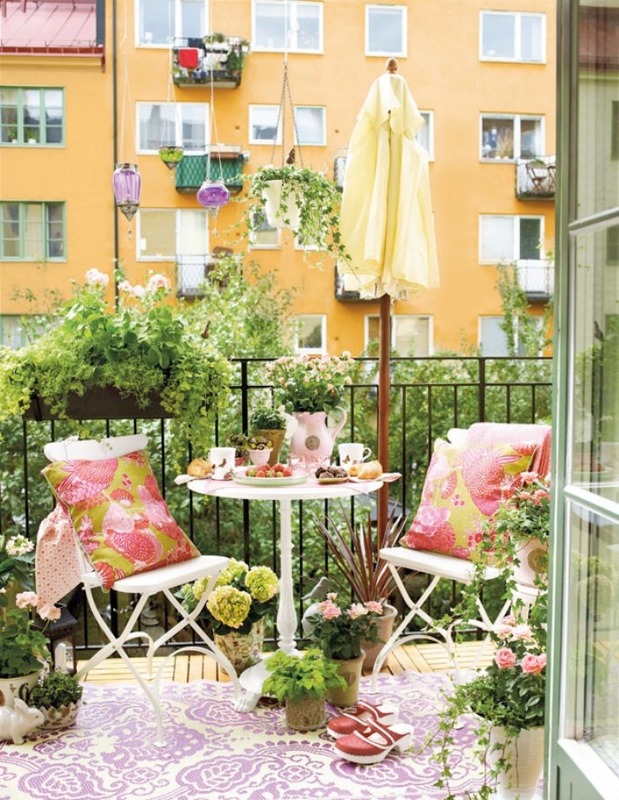 The terrace shown here is an excellent example of just such a happy hued space. Soft and Feminine—We’re loving this lovely look of curvy white wrought iron furniture accented with an engaging floral fabric of pink and green. The effusive greenery adds to the relaxing setting. 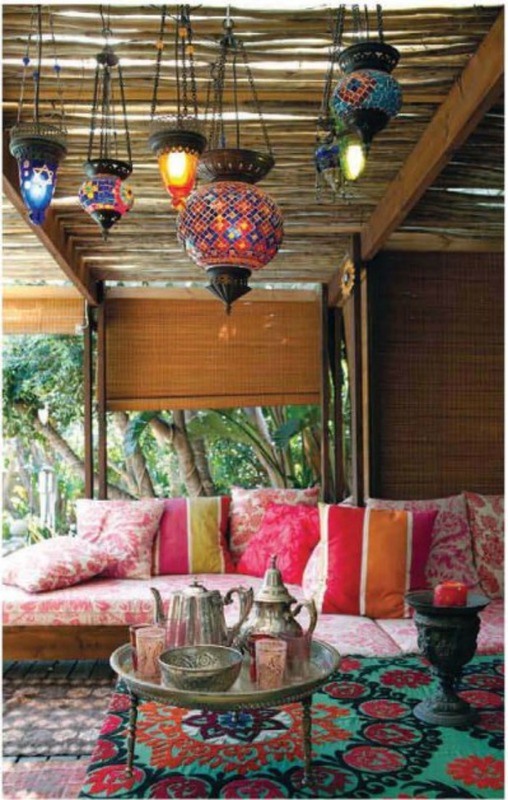 Embrace the Exotic—This outdoor lounge space is filled with fabric and colors to transport you to faraway places filled with color, pattern and lush beauty. A cocktail table is covered with an intriguing suzani woven fabric. Its hues of pink, orange and red are pulled to the low slung lounge’s plump cushions. Cheers to Yellow—One of the happiest colors to fill your indoor and outdoor spaces with is cheery yellow. 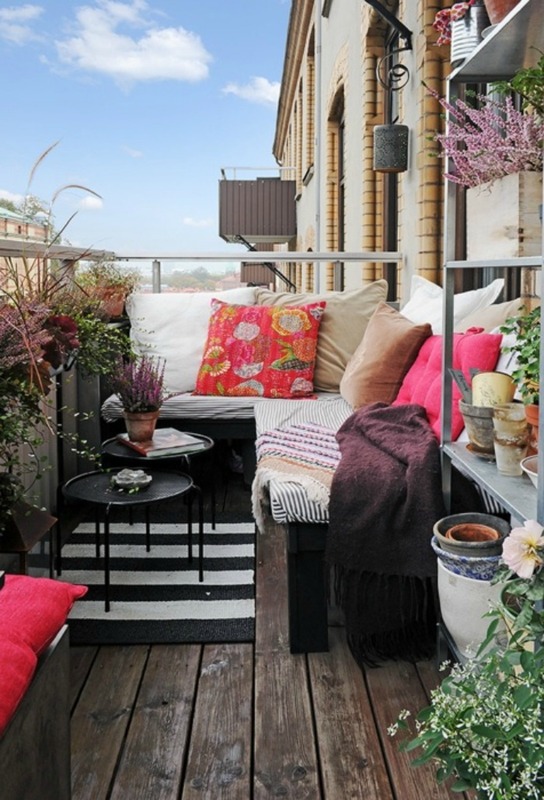 This beauty of a balcony is filled with this eternally sunshiny hue from lounge cushions to flora to table coverings. Timeless Black Iron + Color—Wrought iron patio furniture in black is a classic choice for any style outdoor space. It offers a universal foundation that works well with any color or color combinations. Here a black iron bistro table sets the stage for the festive-hued table covering and rugs. 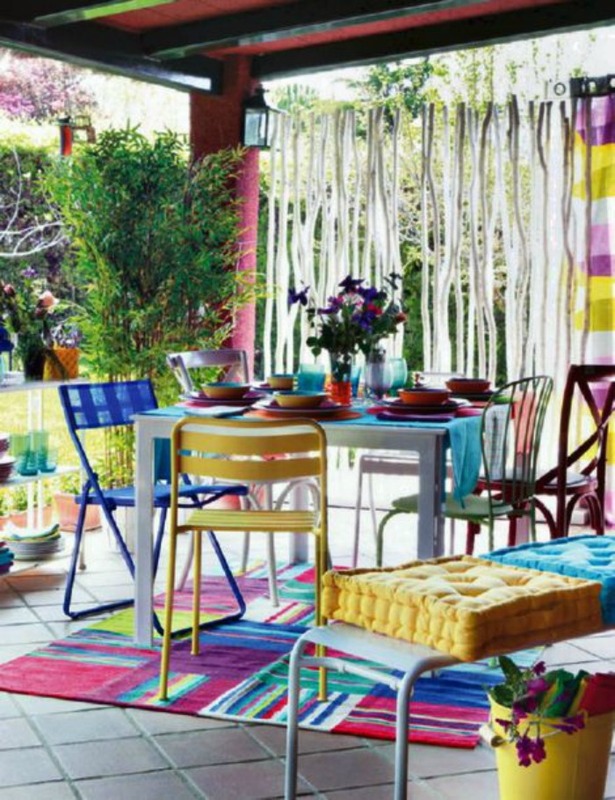 Color Fiesta—This patio embraces color in a big way…there’s no hue in the spectrum not represented. 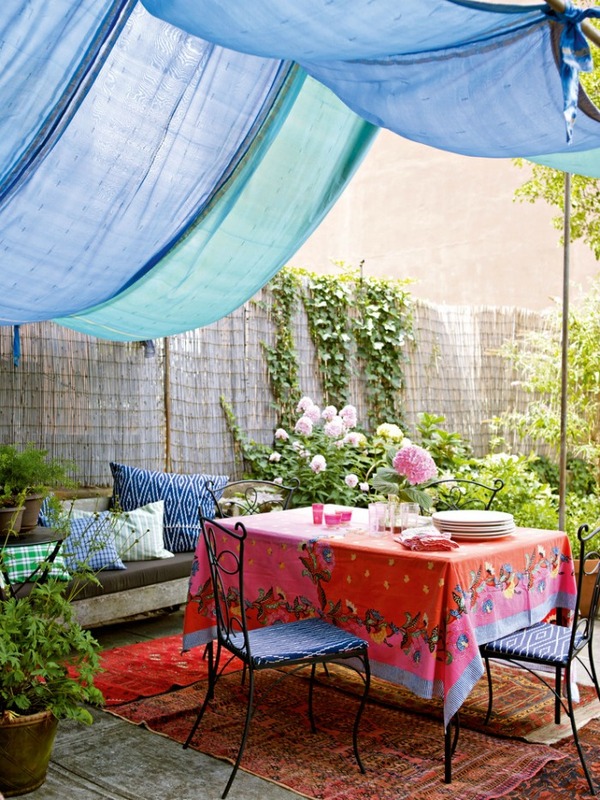 Mix It Up—Color + pattern in outdoor spaces creates drama and fun in unexpected ways. 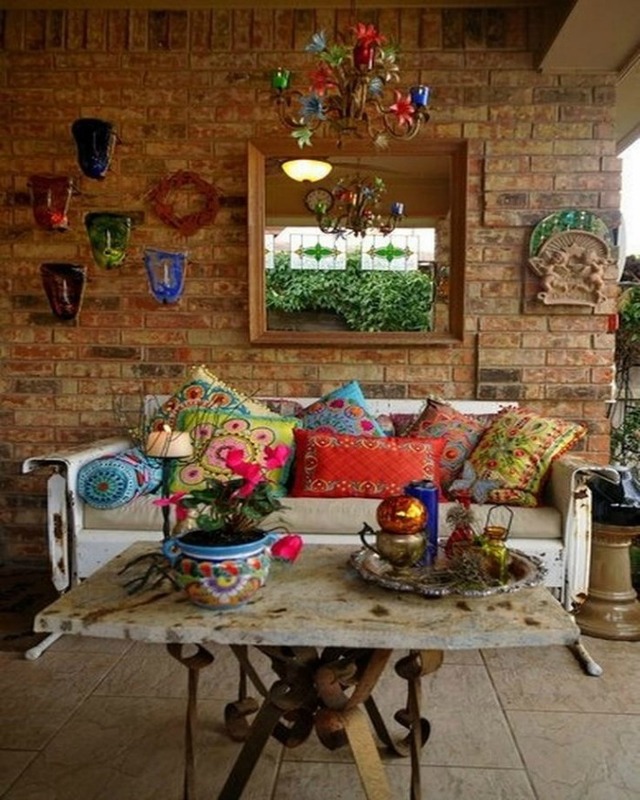 This veranda features a charming canvas of brick, tile and iron accented by a plethora of colorful, patterned pillows. Image Credit: Huffpost.com; Bubos.co; DistroHome.com; HomeInn.net; DigsDigs.com; Pinterest.com; homedit.com; Mohodir.blog; Lushome.com; Memorabledecor.com.